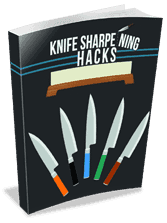 The purpose of this article is to show you that sharpening knives is not that difficult. The process might seem intimidating at first, but in reality you only need to understand the very basics and you will be able to sharpen any knife with ease. 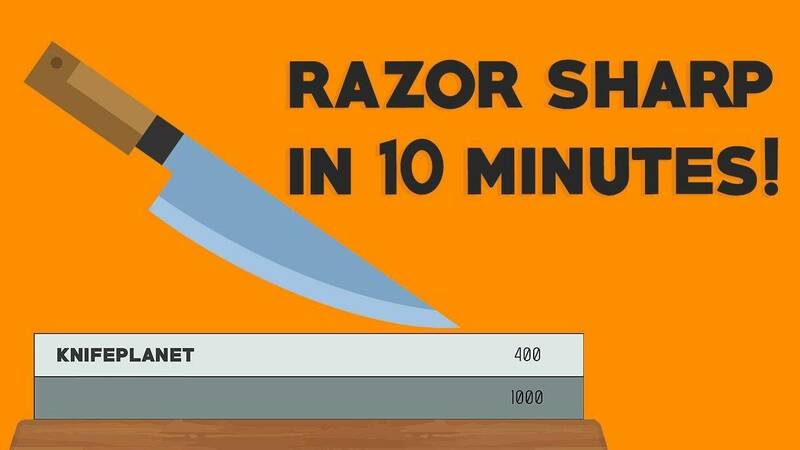 Let’s just get a knife razor sharp by keeping the process as simple as possible. You only need a stone, a dull knife and 10 minutes of your time. 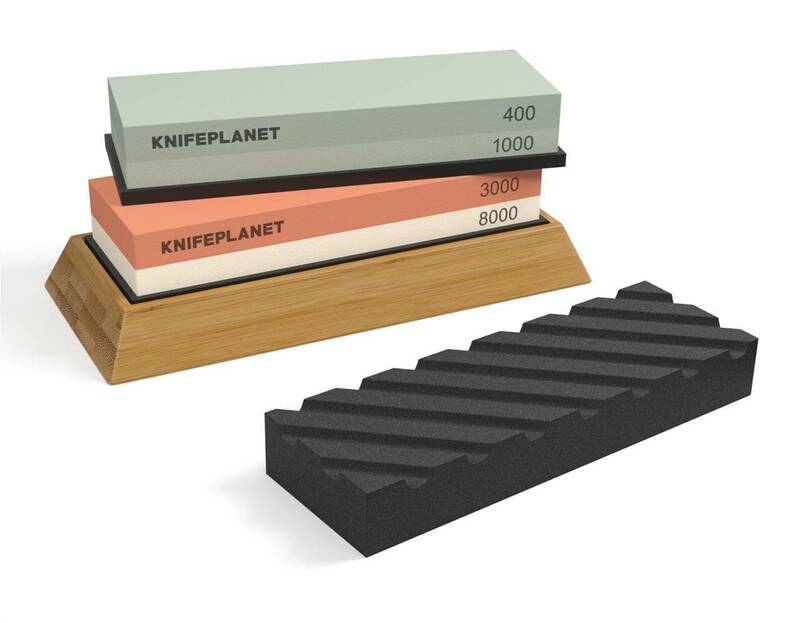 The set will give you all the needed tools to sharpen any knife, and also to keep your water stones flat. Put your water stone in water for around 5 minutes. Sink them in tap water and leave them there. Take the stone out and place it on a stable surface. You want the stone to stay firmly in place while sharpening. The following are the most common beginner questions, explained with simple answers. Put your water stone in water for around 5 minutes. Sink them in tap water and leave them there. Frequently put water on the stones while sharpening, always keep them wet. You could use your hands to sprinkle water on the stones, or you can do this with a bottle or a glass. Put the blade on the stone, and fit your pinky finger under it. That’s it, you now have a good sharpening angle. Here’s a good news for you: you don’t need to stress too much on this! 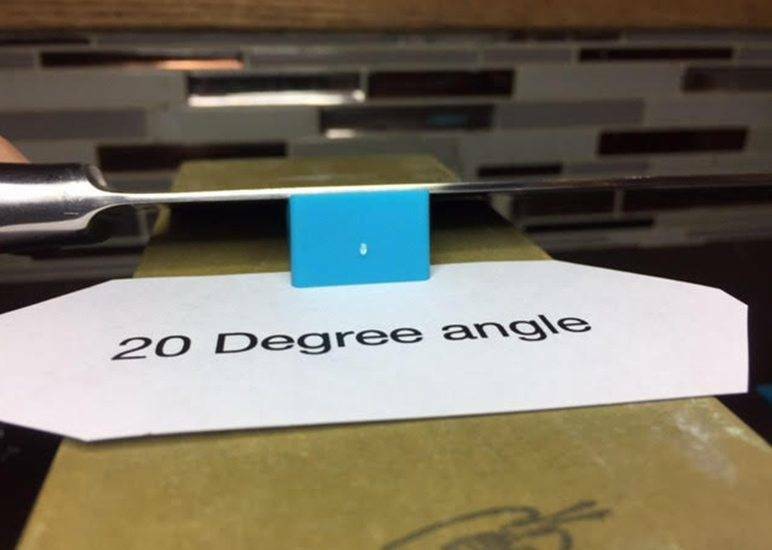 You understood what a 15-20 deg angle looks like? Great. 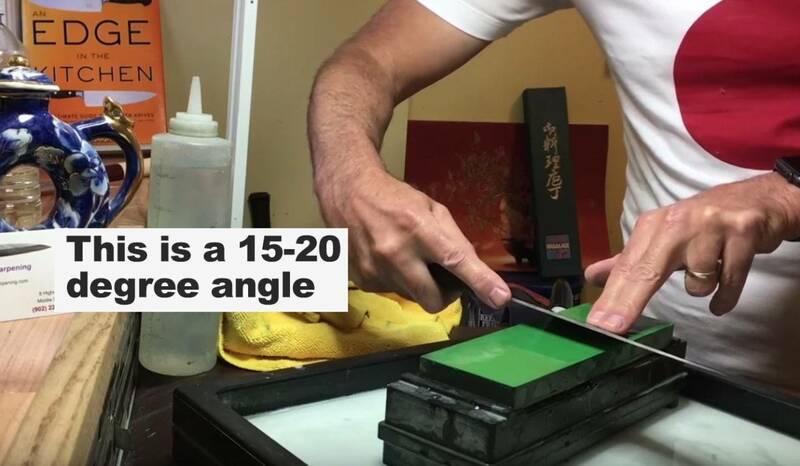 Just try to keep it in that range while sharpening and you’re doing a good job 🙂 You can occasionally stop the sharpening motion and fit your pinky finger to understand if you’re MORE OR LESS maintaining the angle. You can also understand this visually. This is another common question with a simple answer. First, understand this: You apply pressure to remove metal from the dull edge. Metal is hard. You need to apply heavy consistent pressure to achieve this. But how much is “heavy“? Answer: Just grind the blade on the stone, pressing the blade down. I can’t tell you exactly how much weight I am putting, but what happens is that you HEAR the blade grinding on the stone, you might SEE metal debris coming off, you SEE the stone losing material due to its abrasive power. You’re actually putting some effort into this. You’re removing metal from a blade. Feel this. You’ll NOT ruin your knife, so there’s no need to worry about putting too much pressure. As we said, you started sharpening one side of the knife, removing metal, to expose a new sharp edge. Do this for 3-5 minutes on one side of the knife. After doing this, check with your finger THE OPPOSITE SIDE of the edge, the side you were NOT sharpening. Simply pass your finger on it. 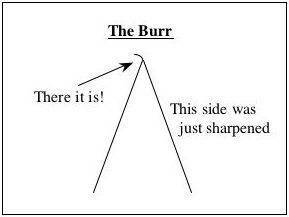 You should feel a rough edge: it’s the Burr. If you check the side that you’re currently sharpening, you will feel a smooth edge, if you feel the opposite side you’ll feel a rough burr. Once you reach the burr, you will feel it. By sharpening SIDE A of the knife you’re removing metal. The result is a burr on the opposite SIDE B. This is a common struggle. First thing you need to know is that raising the burr can take more / less time depending on the hardness of the steel. This to say that you might need to sharpen the same side for another 3-5 minutes. Consider that you can stop every minute and check for the burr again, keep the sharpening process natural, there are really no rules you should strictly follow! If there is still no burr, Try to apply MORE pressure. HEAVY CONSTANT pressure along the edge. You can’t damage the knife, don’t worry. Keep the angle fixed and apply more pressure. Maybe you weren’t applying enough. After doing this, check for the burr again. You need to feel it along the whole edge, because we want the whole blade to be sharp! Once you feel for the burr again, this time on the opposite side, you’re almost done! You’ve successfully raised the burr on both sides. This means that you’ve exposed a NEW sharp edge. IMAGINE THIS: You’re cleaning the edges from the burr. After you clean the edges, the new sharp edge will show up. USE LOWER PRESSURE! Heavy pressure was to RAISE the burr. You don’t need it anymore! Keep alternating sides, and while doing this check with your fingers: you need to feel the burr GOING AWAY. You don’t want it or need it anymore. Do this until there is NO MORE BURR on either sides. You can check your knife for sharpness. Simply try to cut a tomato, or a piece of paper. Satisfied? You can wash your stones and dry them with a towel after sharpening, but even if they seem completely dry leave them overnight to air dry properly before storing them. You don’t want any mold to form. You should use your intuition and adapt based on the knife you’re sharpening. The first time it will be a mess, the second time you’ll still stress too much over angles and pressure… scared to do it all wrong… on the 3rd time you’ll finally let go and actually improvise and see that nothing wrong can happen. Worst case you need to try again at a more fixed angle and higher pressure. Trust me, it’s easy to sharpen a knife. Without worrying too much about equipment and technique, LEARN the basics by practicing and in a matter of 1 or 2 sessions you’ll be able to sharpen all your knives!